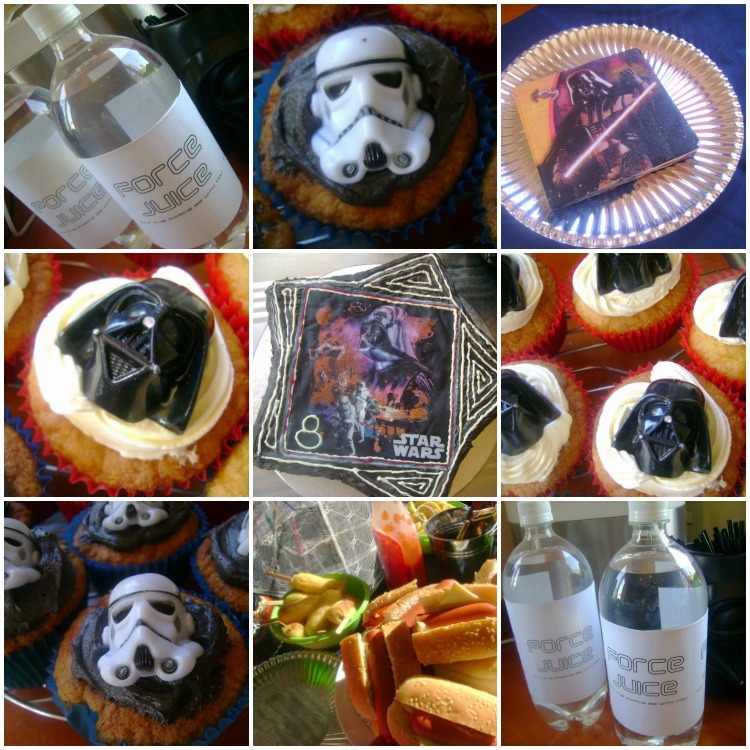 A long time ago in a galaxy far far away... we had a Star Wars birthday party in honour of Dash turning Eight. 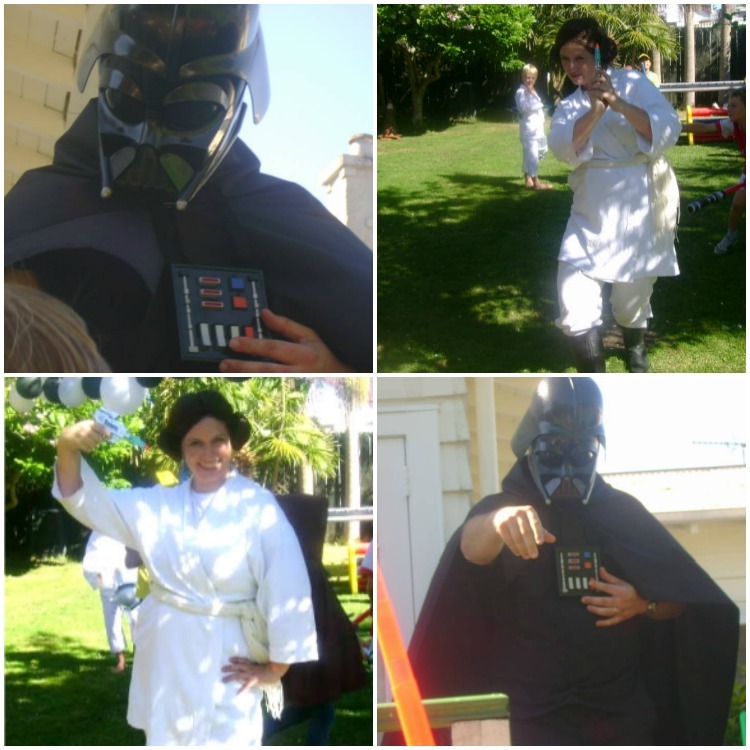 Anakin, Obi Wan, Darth Vader and Princess Leia have a made a comeback did you know? At least in our family they have. 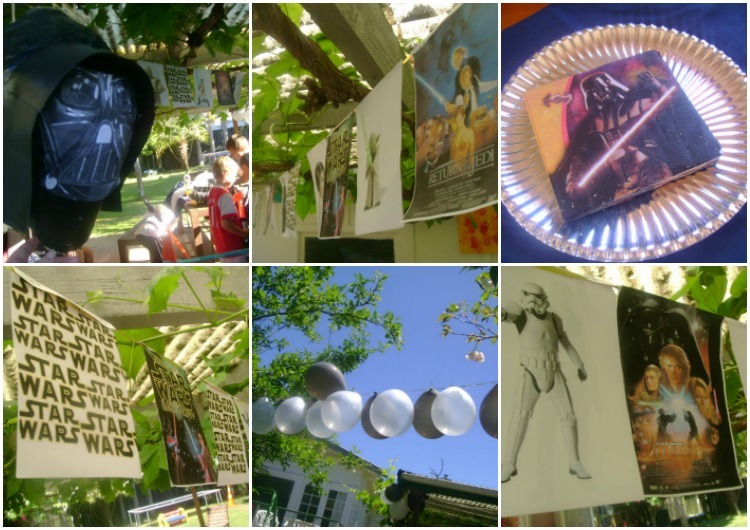 Dash loves Star Wars, and this was one fun birthday party to put together. Force Juice to drink. That would be .90c budget lemonade with the wrapper peeled off and replaced with my own version, printed from the computer. Gave me such a kick to hear the boys asking: "Can I have some more Force Juice please???" Princess Leia: That would be me, wearing my bathrobe and boots. That authentic looking wig was bought from Geoff's Emporium for a mere $10. The things we do. 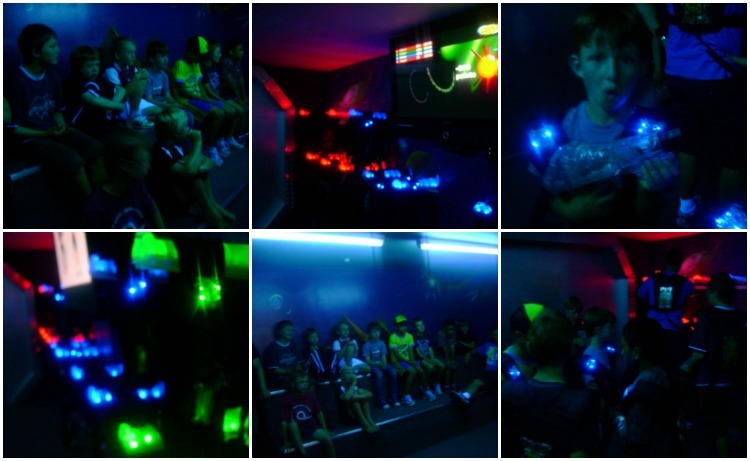 We began the party at Megazone Ponsonby for a friendly laser battle; sweaty work all that running and fighting and hiding. I managed to destroy two team's bases single-handedly, not bad for an old mama. 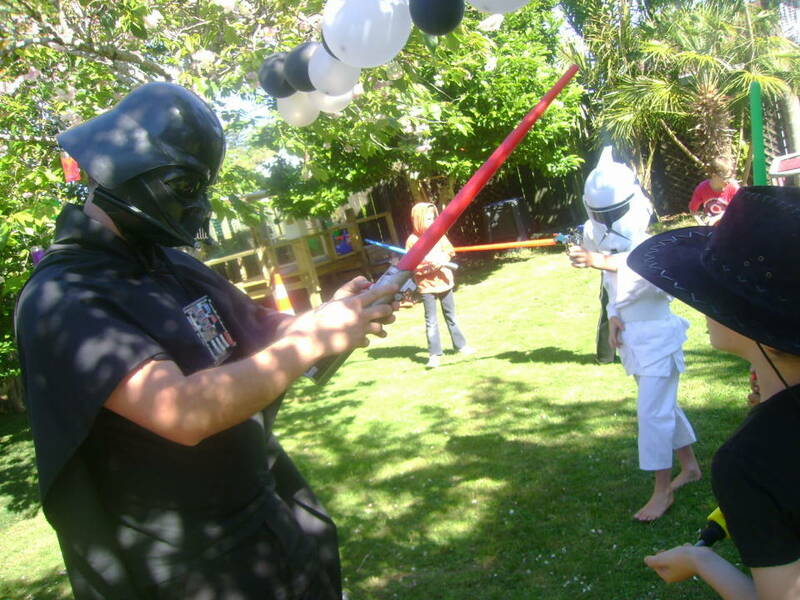 Then it was home for a quick change into our Star Wars personas and some friendly fake light saber duels; Darth Vader was a popular target and often had to fight off multiple Jedi apprentices at once. 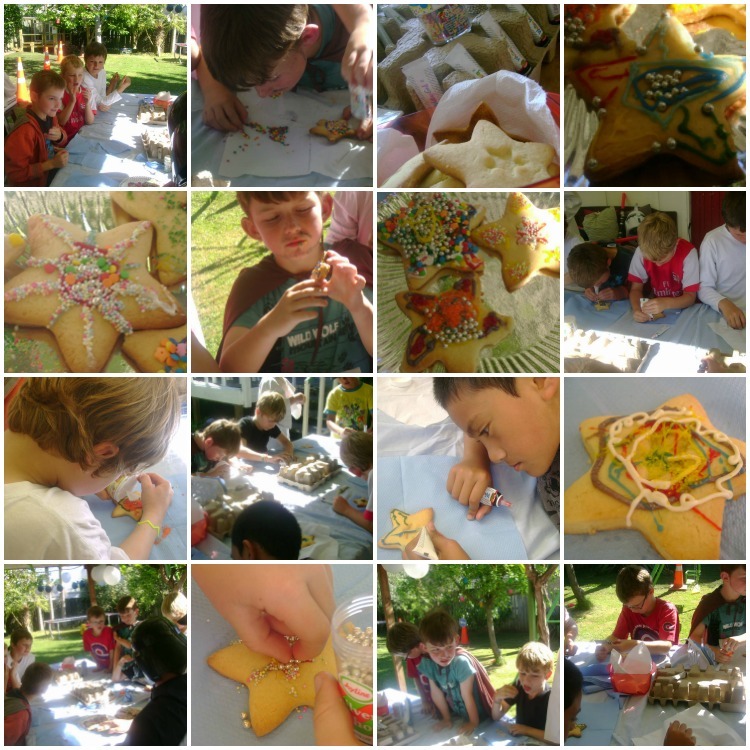 After all that adrenaline, what better than to calm things down with a bit of cookie decorating. Yes, that's right. We got 10 eight year Jedi knights to sit down and decorate cookies. They really enjoyed it! And what a lovely job they did; I was super impressed with their talents and attention to detail. 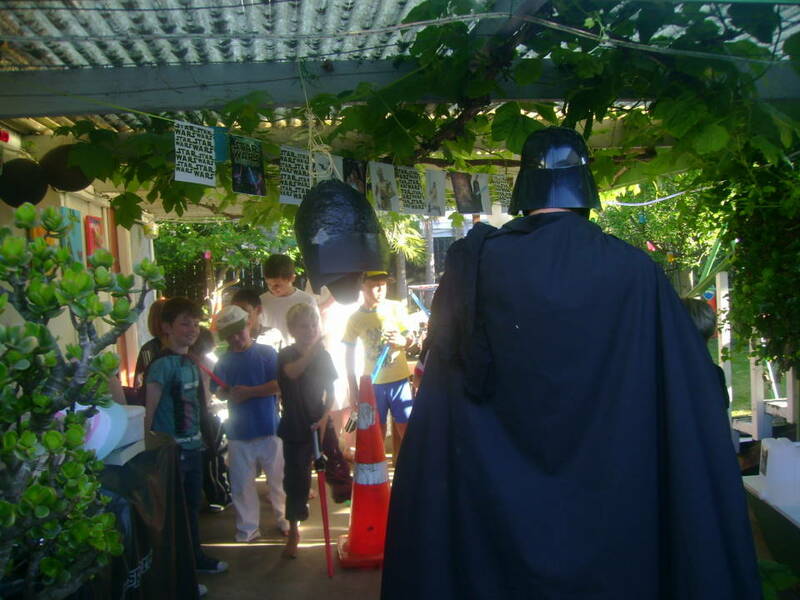 Darth Vader picked the winner who received a pack of Star Wars stickers (from the $2 shop - amazing what you'll find there). I used the tubes of coloured icing that come in packs of four from the supermarket; much less mess than the homemade stuff, and very easy to use. After food and Cake, the guests all went around and took turns to say a few words to Dash about what they appreciate about him, which was really touching. Dash reciprocated and thanked them all for being his friends and coming to his party. It was a warm fuzzy moment all captured on handycam. 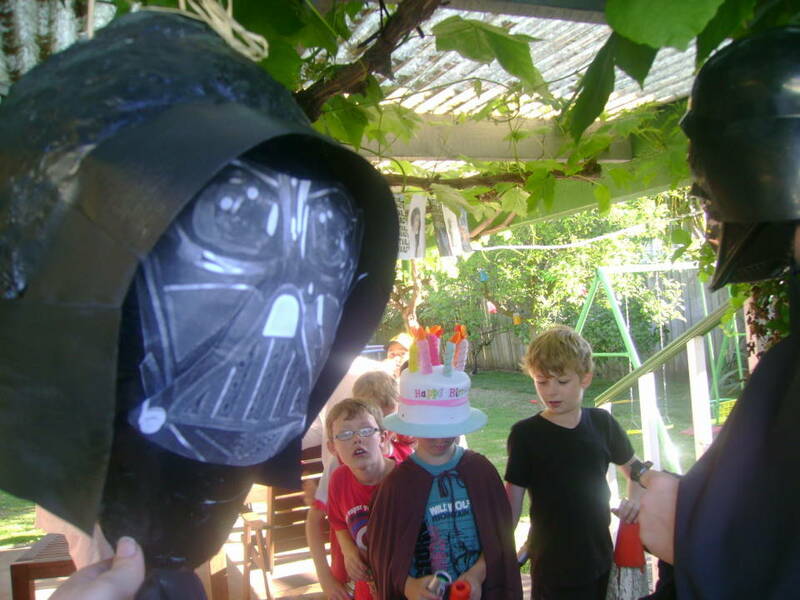 Then it was time to destroy Darth Vader (the pinata, that is). 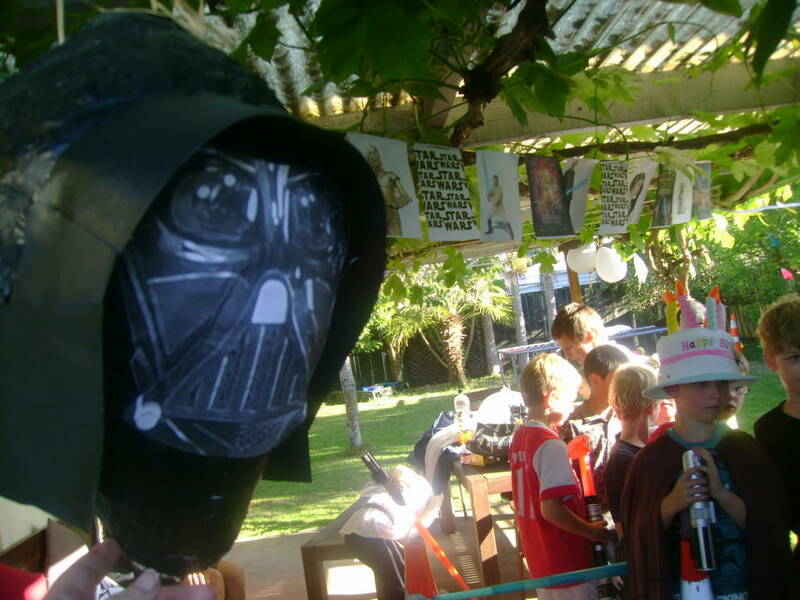 I made this super easy Darth Vader pinata and filled it with Mars Bars, Milky Ways and other wrapped sweets. 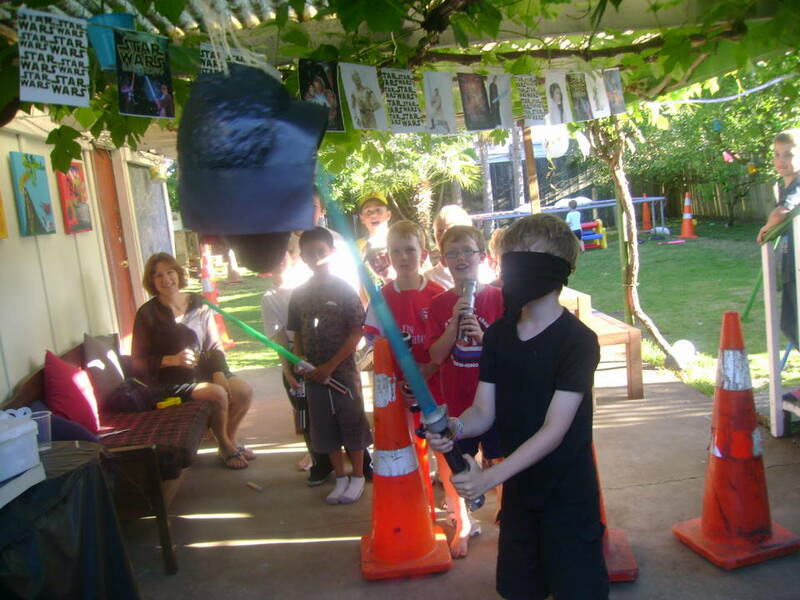 The boys were blindfolded, spun around several times and then had to use their lightsaber (and the Force) to bring down Darth. Always a good giggle watching people swing at the air while blindfolded. Tee hee. Topping it all off we watched Return of the Jedi (the movie). A very fun-packed party, I must say. I overheard one lad say to another, "This is the best party I've ever been to...!" Makes it all worth it when they enjoy themselves so much, doesn't it? wow Simone, it looks great! the force was definitely wiht you! what a lot you packed into the party. Lovin' the 'stars of the show' what great outfits. Love that bunting too, great idea!! I bet Dash had a great time. Amazing! 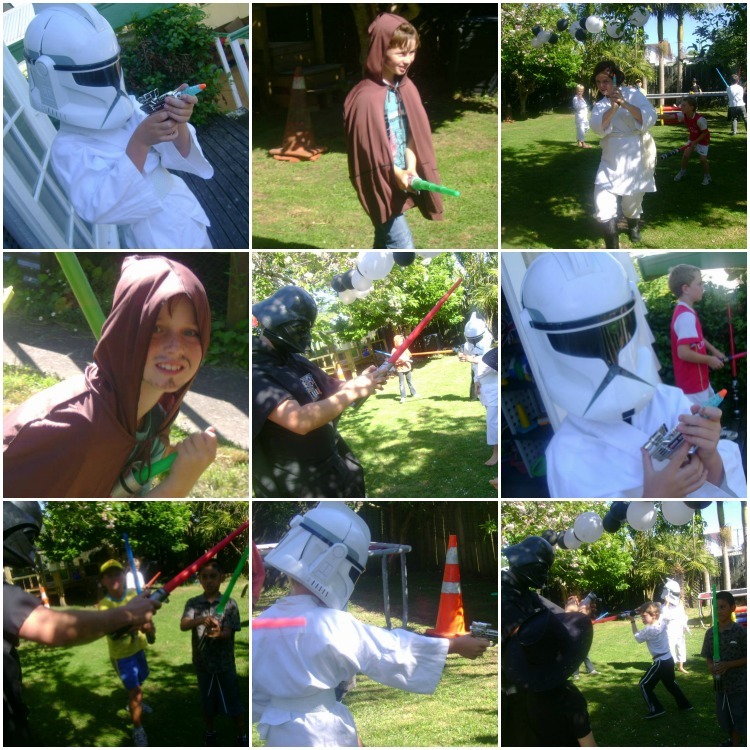 My boys are really into Star Wars - not sure if I want to show them this post as they'll be begging for a Star Wars party too!! 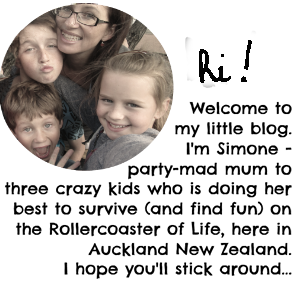 Such an amazing job - love the cheap but effective ways you've put the party together. 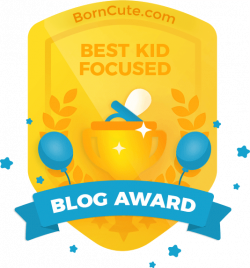 Awesome work guys - and you look so cute as Princess Leah!! You are the party princess! Amazing job and attention to detail. Gee whizz gurl - you make parties look GOOOOOOOOD! What a fab day for Dash - I bet he was on a high for AGES after. 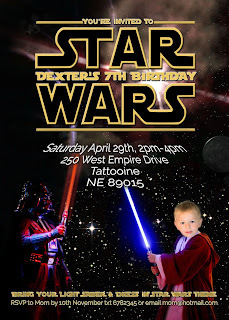 A Star Wars party has already been requested for my guy's 5th birthday next year, so I am definitely going to be coming back to this post for inspiration! 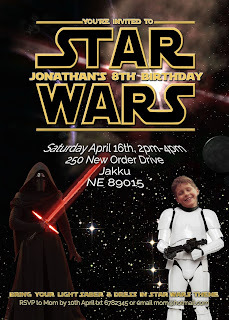 I too have a Star Wars fan and we did the Star Wars thing for his 5th birthday. 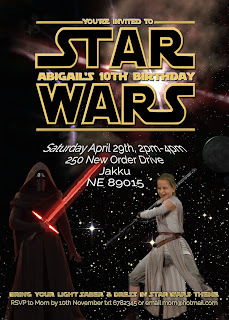 The light saber fight turned into a water fight which was the highlight of the party. The helium Darth vader balloon had to stay up all through the xmas season beside the xmas tree which made that years xmas photos interesting! Hi Simone, what a fantastic party - and thanks for the shout out re: cupcake rings! 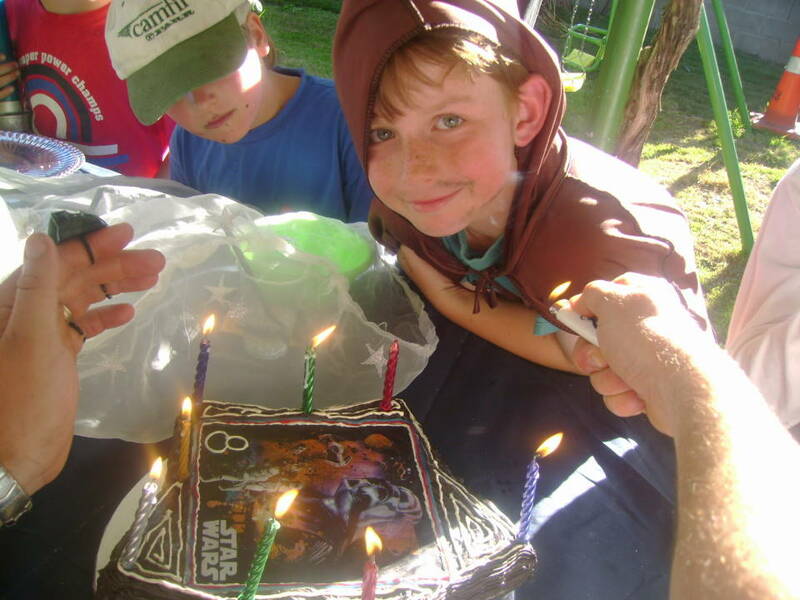 My boy is having a Star Wars Party in a week or so, so I was surfing for tips and found your blog. Love it! 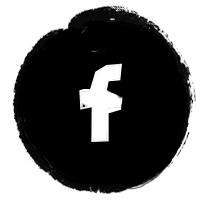 Yay, just popped in to have a nosy at you parties! I made icecream yodas with my intermediate cooking class today after reading about your star wars family dinner! You are such a generous lady, offering all your ideas!!!! Happy Birthday to Me. Again. Already.